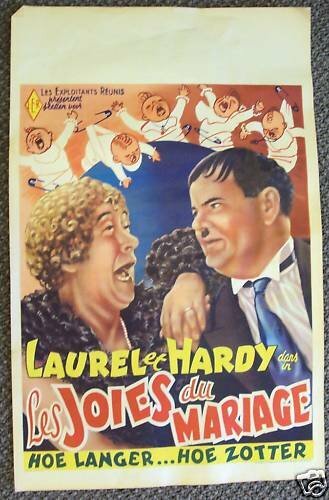 This is an ORIGINAL Movie POSTER in GREAT SHAPE measuring 14” x 22, from Belgium, for the 1933 comedy film from HAL ROACH, featuring his famous comedy duo LAUREL & HARDY in the 1933 film, Twice Two Director:James ParrottBrain specialist Oliver and his secretary Stanley bicker over listening in on each other's phone calls. Nevertheless, plans procede to celebrate the anniversary of their weddings to each other's sisters. At home, preparations go awry as the two wives also get on each other's nerves. Double Trouble With Mr. Laurel & Mr. Hardy Featured on the poster are film stars: Stan Laurel... Stanley / Mrs. HardyOliver Hardy... Oliver / Mrs. LaurelPOSTER is inGood SHAPE for it’s age, colors are still bright, no wear slight edge wear, has a waciness from moisture tiny corner bend. has the foreign film title LES JOIES du MARIAGE on the bottome ad a BRUXXLES address printed below and says it’s printed in BELGIQUE. Great for the L & S fan!MORE INFO ON HAL ROACH: Hal Roach was born in Elmira, New York in 1892. After working as, among other things, mule skinner, wrangler and gold prospector, he wound up in Hollywood and began picking up jobs as an extra in comedies, where he met comedian Harold Lloyd in 1913 in San Diego. Roach came into a small inheritance and began producing, directing and writing a series of short film comedies under the banner, Phun Philms, starring Lloyd around 1915. Initially these were abysmal, but with effort, the quality improved enough to be nominally financed and distributed by Pathe and the Roach/Lloyd team proved quite successful after the creation of Lloyd's now-famous 'Glasses Character,' enabling Roach to start his own production company and eventually bought his own studio. Hal Roach Productions became a unique entity in Hollywood; it operated as a sort of paternalistic boutique studio, releasing a surprising number of wildly popular shorts series and a handful of features. Quality was seldom compromised and his employees were treated as his most valuable asset. Roach's relationship with his biggest earner, Harold Lloyd, was increasingly acrimonious after 1920. After achieving enormous success with features, Lloyd had achieved superstar status by the standards of Roaring Twenties and wanted his independence. The two men severed ties with Roach maintaining re-issue rights for Lloyd's shorts for the remainder of the decade. Despite facing the prospect of losing his biggest earner, Roach was already preoccupied by the cultivating his new kiddie series, Our Gang, which was an immediate hit with the public. By the time he was 25, Roach was wealthy and increasingly away from his studio, traveling extensively across Europe. By the early 1920s he had eclipsed Mack Sennett as the King of Comedy and created many of the most memorable comic series of all time, even by today's standards. These include the team of Stan Laurel and Oliver Hardy, Charley Chase, ''Snub' Pollard' and especially the long running Our Gang (AKA "The Little Rascals" in TV distribution) series. After his studio's distributor, Pathe, disintegrated in the U.S. after it's domestic representative Paul Brunet returned to France in 1927, Roach was able to secure an even better deal with MGM (his key competitor, Mack Sennett, was also distributed by Pathe, but was unable to land a deal, ultimately declaring bankruptcy in 1933). For the next eleven years Roach shored up MGM's bottom line, although the deal was probably more beneficial to Roach. In the mid-1930's Roach became inexplicably enamored with Benito Mussolini, and sought to secure a business alliance with the fascist government's recently completed film complex, Cinecitta. After Roach asked for (and received) assurances from Mussolini that Italy wasn't about to seek sanction against the Jews, the two men formed RAM ("Roach And Mussolini") Productions--- a move that appalled the powers at MGM parent Leow's Inc. These events coincided with Roach selling off Our Gang to MGM and committing himself solely to feature film production. In September 1937, Il Duce's son, Vittorio Mussolini visited Hollywood and his studio threw a lavish party celebrating his 21st birthday. Soon afterward, the Italian government took on an increasingly anti-Semitic stance and in retribution, Leow's chairman, Nicholas Schenck canceled his distribution deal. He signed an adequate deal with United Artists in May 1938 and redeemed his previous record of feature misfires with a string of big hits: Topper (1937) (and it's lesser sequels), the prestigious Of Mice and Men (1939) and, most significantly, One Million B.C. (1940), which became the most profitable movie of the year. Despite the near-unanimous condemnation by his industry peers, Roach stubbornly refused to re-examine his attitudes over his dealings with Mussolini, even in the aftermath of WW2 (he proudly displayed an autographed portrait of the dictator in his home up until his death). His tried and true formula for success was tested by audience demands for longer feature-length productions, and by the early 1940's he was forced to try his hand at making low budget full-length screwball comedies, musicals and dramas, although he still kept turning out two-reel comedies, he tagged as "streamliners," they failed to catch on with post-war audiences. By the 1950s he was producing mainly for television. He made a stab at retirement but his son, Hal Jr., proved an inept businessman and drove the studio to the brink of bankruptcy by 1959. Roach returned and focused on facilities leasing and managing the TV rights of his film catalog. In 1983 his company developed the first successful digital colorization process. Roach then became a producer for many TV series on the Disney Channel, and his company still produces most of their films and videos.More info on Oliver Hardy: His Scottish-English parents were never in show business. As a young boy he was a gifted singer and, by age eight, was performing with minstrel shows. In 1910 he ran a movie theatre, which he preferred to studying law. In 1913 he became a comedy actor with the Lubin Company in Florida and began appearing in a long series of shorts; his debut film was "Outwitting Dad" (1913). 1914-5 was the "Pokes and Jabbs" series; 1916-8 saw the "Plump and Runt" series, 1919-21 the "Jimmy Aubrey" series, and from 1921-5 he worked as an actor and codirector of comedy shorts for Larry Semon. In 1917 he had played a bit part in A Lucky Dog (1921), starring Stan Laurel. His first two-reeler with Laurel was _Forty-five Minutes from Hollywood (1926)_ . Their first release through MGM was Sugar Daddies (1927) and the first with star billing was From Soup to Nuts (1928). Their first feature-length starring roles were in Pardon Us (1931). Their work became more production-line and less popular during the war years, mostly working for Twentieth Century-Fox. Their last movie together was The Bullfighters (1945) except for a French failure (Atoll K (1951)). He appeared without Laurel in The Fighting Kentuckian (1949) and Riding High (1950) and died seven years later. MORE INFO ON STAN LAUREL: His father was an actor and theatre manager. He made his stage debut at the age of 16 at Pickard's Museum, Glasgow. He traveled with Fred Karno's vaudeville company to the United States in 1910 and again in 1913. While with that company he was Charles Chaplin's understudy, and he performed imitations of Chaplin. On a later trip he remained in the United States having been cast in a two-reel comedy, Nuts in May (1917) (1917, released the following year). There followed a number of shorts for Metro, Hal Roach Studios, then Universal, then back to Roach in 1926. His first two-reeler with Oliver Hardy was 45 Minutes from Hollywood (1926) . Their first release through MGM was Sugar Daddies (1927) and the first with star billing was From Soup to Nuts (1928). Their first feature-length starring roles were in Pardon Us (1931). Their work became more production-line and less popular during the war years, mostly producing for Twentieth Century-Fox. Their last movie together was The Bullfighters (1945) except for a French failure ("Atoll K", 1951). In 1960 he was given a special Oscar "for his creative pioneering in the field of cinema comedy". Five years later he died. Winning buyder agrees in advance to pay an additional Mail postage (Foreign orders will require additional postage) and to remit full payment within 10 days after notification from the seller. - PLEASE ALLOW 10 TO 14 DAYS FOR DELIVERY. California residents must add - state sales taxes. Be sure to click on "View Seller's Other products" for more great items like this Powered by eCRATER . List your items fast and easy and manage your active items.